As mentioned in our previous Cobalt Code SCAM Review and Blacklist Notification, Grant Stone and his fake software, app, and Auto-trader have been proven to be an internet fraud scheme. Despite everything, we keep getting complaints from angry day traders who were baited and misled into funding trading accounts with unregulated offshore brokers. At times these customers funded multiple accounts under false pretenses of doubling their money on Autopilot faster. Apparently the customer service responds to very specific types of emails queries and ignores the rest. The majority of complaints arriving these days have to do with bonus locks intended to cosmetically inflate your balance and provide an excuse to deny withdrawal requests. 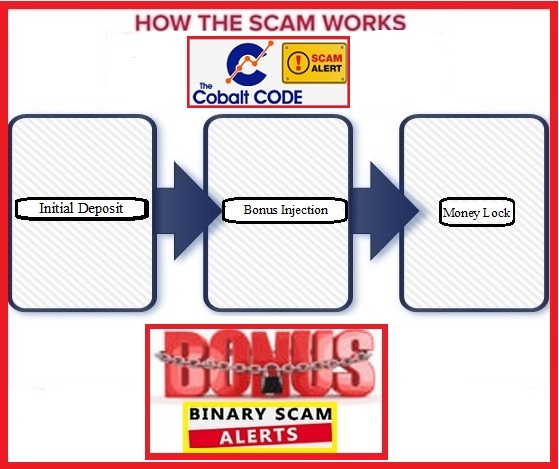 How Does the Cobalt Code Scam Work? The diagram bellow illustrates how this dirty scam tactic works. The marketers who are in charge of promoting the bogus app recruit the innocent victims who in turn fund their trading accounts. Then the broker or “analyst” contacts the customer and provides them with “a strategy that is especially designed to get him an optimal return on investment” with the smallest possible risk. The broker then proceeds to have the trader sign documents which basically absolves him from any wrong-doing and squarely places the responsibility on the victim (that’s you). When you sign the bonus agreement form you are basically waving goodbye to your money, especially when it comes to big amounts. Usually you will be required to trade 20-30 times your original deposit + bonus amount granted in order to qualify for cashing out. The chances of that happening are close to zero and your money will go up in smoke like mesquite in a southern barbecue grill. Mr. Grant Stone states that he was employed as a mid-level manager at a Madagascar cobalt mine off the coast of Africa. He noticed how the rich owners made their fortunes by manipulating cobalt stock, and decided to be “extra-nice” to his bosses until they revealed their so-called “secret code” for massive profits. Now, of course there are only a few copies of the cobalt code which can be handed out for free, but only a lucky few “action takes” will gain access to it and have a chance to profit like the wealthy elite. Transparency, there is no access to the real trading history and no ability to influence the broker selection process. The customers service was only responsive when it came to questions having to do with funding an account, but never when it relates to cashing out or withdrawing capital. Similar to Walter Green and the Millionaire Blue Print (AKA Free Money System), when someone steps up and claims he is a Multi-Millionaire our staff checks him out to see if there is some kind of public profile on various social media like Facebook or LinkedIn or some type of mention on local news outlets. We found nothing about this ghost, not to mention any company linked to his name. This should serve as a big red flag for anyone searching the internet about the Cobalt Code and Grant Stone. 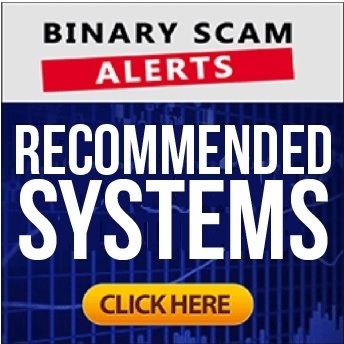 The Cobalt Code and Grant Stone is a very dangerous binary options investment scam. Our in-depth reviews and investigations have provided conclusive proof and a broad base of evidence that leaves no room for doubt. We understand that some of you have already been deceived and despite everything believe the app is genuine and legit. That is because you were led to believe that it is your fault, when in reality the broker and software owners are conspiring behind your back to steal your hard-earned money. We implore you to refrain from investing with this system and can’t overstate how deceptive and misleading it is. If you are still not sure and are considering buying into this scheme please contact us through our Facebook Page and YouTube channel for additional information and actual stories from people who were scammed.